“The future… The polar ice caps have melted, covering the earth with water. Those who survived have adapted, to a new world.” So begins sci-fi/adventure/Kevin Costner movie Waterworld, one of the most famous box office bellyflops of all time. The first thing to notice is the sheer scale of the piece. With enormous sets, elaborate set-pieces and more water than a Scottish rainfall, it’s easy to see how this became the most expensive film ever made at the time in 1995, with a cost of $235m. The result is effective and immersive, building a lived-in world full of various wet threats – whether it’s the scavengers who’ll slit your throat for a sip of fresh water, or the so-called Smokers who stockpile gasoline and terrorise the oceans. At this point, it’s worth noting the obvious similarities with Mad Max: The Road Warrior, cited by co-writer David Twohy as a major influence. This is evident in every aspect of the film, from its dieselpunk design to its madcap action. The films also share a cinematographer in Dean Semler. In fact the only real difference is that it’s water instead of desert. And Jeanne Tripplehorn instead of a dog. The cast are having a whale of a time, especially Dennis Hopper as the chain-smoking villain. Actually, the only person not having fun is Kevin Costner, whose lead performance is surprisingly earnest. He plays a nameless drifter with webbed-feet and gills. Let’s call him The Toad Warrior. The character is also notable for treating everyone around him with amoral contempt; he almost pimps out Helen (Tripplehorn), and throws an orphan (Tina Majorino) into the sea. Evidently, this is all quite bizarre. Tonally mismatched, Kevin Reynolds’ movie is a cross between George Miller and Steven Spielberg; one moment it’s damp Mad Max, the next it’s soggy Indiana Jones. This goes some way to explaining its lacklustre performance at the box office, compounded by serious production troubles and massive overspending. Multimillion-dollar sets were destroyed by hurricanes; Joss Whedon was flown out to the set to do last-minute script rewrites; Kevin Costner was on the set for 157 days and at one point nearly died. No wonder he looks so pissed off. But despite the overambitious, amphibious production, it’s still a great watch, although not on a full bladder. At least you can see where all the money went, which is more than can be said for many Hollywood flops (*cough* R.I.P.D). 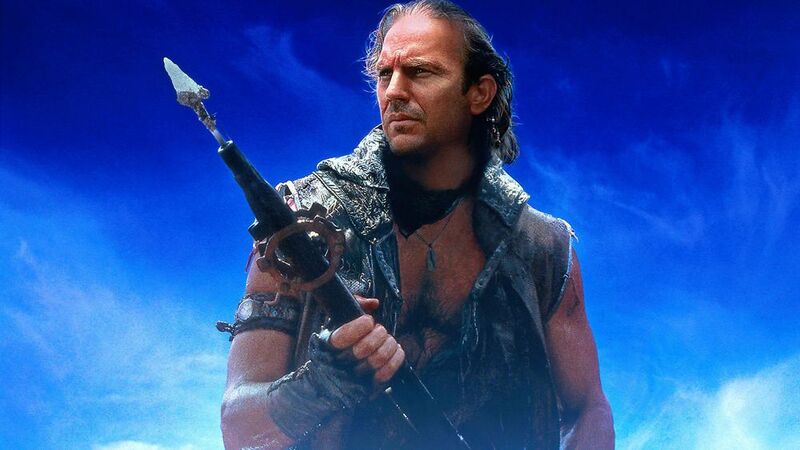 Essentially a post-apocalpytic pirate movie, Waterworld is swashbuckling good fun. And the best film about climate change since An Inconvenient Truth.